Right now the loft is loaded down with cymbals after a few quick buying runs so I'm getting ready to do another cymbal sale for those of you who missed the last one. I've got a ton of rare, used and vintage cymbals in stock right now so take a look and grab them before they're gone. I managed to find some awesome vintage Zidljian crashes and rides, as well as a great selection of sought after modern cymbals like Paiste Prototypes and Sabian Vaults. Check out my cymbal sale buyer's guide below for a couple of my favorites! Also if you're not on the mailing list yet, make sure to sign up so you don't miss out on upcoming sales!! Sign up with your email address to receive any upcoming sale coupons!! Thanks for signing up! I'll be in touch! In the meantime I thought I'd do a few profiles of some of the awesome cymbals I've got in stock right now (sorry to those reading this after the fact) as a buying guide for the upcoming sale. Since I've already gone into detail on some of the boutique Turkish cymbals before I'm going to focus more on the big guys here and write about some of my favorite Zildjian cymbals I've got at the loft right now. These are some of my favorite hi-hats, and right now I've got a great pair of vintage 14˝ Zildjian Avedis Quick Beats in stock. These hats often get compared to Zildjian's New Beat Hi Hats for their versatility—you can play funk, rock, soul, jazz, pretty much whatever you want with these hi hats. Quick Beats have a vented bottom that allows air to escape the hi hats. The vented bottom gives Quick Beats a much crisper “chick” than Zildjian's New Beat hi hats because it prevents air lock. Quick Beats also feature a flatter profile and heavier bottom cymbal than Zildjian New Beats normally have. 14 inches is an ideal size for these. The sound of these is nice and focused and can make any drummer's sticking sound articulate. Nice bright tone and good volume that cuts through the mix. This particular pair is from an older run and has great vintage warmth that so many drummers are looking for. These are awesome and a must have if you're looking for professional quality hi hats with crisper, unique tone!! 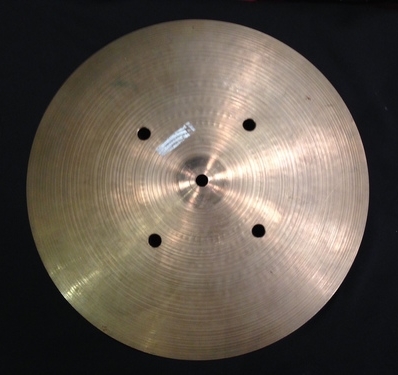 Looking for an awesomely dry crash cymbal? It doesn't get any drier than this awesome Zildjian K Custom Crash cymbal. Look no further, this Zildjian K Custom Special Dry Crash sounds epic with a nice dark pitch and dry, borderline trashy tones. This is a faster crash compared to other 18 inchers and has short sustain. Zildjian Ks are legendary for their low, dry tones from the jazz era and this crash cymbal is custom built to be even drier! Zildjian's factory lathed the bottom, scored the top and used unique hammering (giving the cymbal a cool pattern) to get the unique tone. Not only does this cymbal sound great, it's a rare find. These were made in 2011 when they were released only to small dealer shops. This cymbal is perfect for a jazz crash, metal drummers who love dark, dry cymbal tones or anyone who just likes how these awesome cymbals sound. Alright guys, I'm going to keep this one short and sweet. As always if you have any cymbal or drum questions get in touch. And if you haven't already done so get on the mailing list so you don't miss your opportunity to grab great cymbals like the Zildjian Quick Beats or K Custom Dry Crash at a discount on top of my already awesome prices. Posted on August 10, 2015 by Pete and filed under Offer, Inventory, Music Gear and tagged Cymbals Zildjian Sabian Vintage Cymbals.